If you know much about the sacroiliac joint, you likely either have suffered from SI pain or have treated someone who has. The sacroiliac joints, which are near the two dimples at the base of the lower back, are generally stable and supportive. But for some of us, instability in the ligaments, asymmetries and the body and other conditions can lead to recurring SI dysfunction. The SI joints form the junctions of the sacrum and the ilium bones in the back pelvis. When the sacrum shifts out of healthy alignment, grinding pain can occur. This pain is often felt only in one small area on just one side of the lower back (near one "dimple"). It can be more intense at the midpoint of the transition between standing and sitting (but sometimes not at the beginning and ending phases of this transition). SI dysfunction is more common in women, and seems to be particularly prevalent among yogis. Flexible practitioners who don't focus on careful alignment while practicing yoga (especially while practicing forward bends and twists) may find themselves throwing their SI joints out of whack. The good news is that there are many effective "quick fixes" to ease SI pain. Once you are able to return the sacrum to its proper position within the ilium bones, pain disappears almost immediately. But because the SI joint can be thrown out alignment in different ways, not all remedies will work for all sufferers. As always, it's best to seek guidance from your own health care provider, who can help treat your particular SI issue. In the meantime, if you're interested in learning more, this article by master teacher Judith Lasater is a great place to start. Judith offers a comprehensive overview of the joint and offers strategies for practicing yoga that help heal rather than hurt the joint. She offers another excellent take here, with a few simple yoga movements that can help bring relief. Doug Keller offers valuable information for sufferers of SI discomfort here. And yoga teacher Roger Cole offers another close look at SI issues here and practice tips for yogis here. Physical therapist Richard DonTigny offers a wealth of information about the structure and function of the SI joint at The Low Back Site. He offers a range of helpful movements and exercises that can help relieve SI dysfunction here. Similar exercises are detailed in this video by Travis McCann. (I've had good luck with these particular movements while helping my son relieve his own SI discomfort). 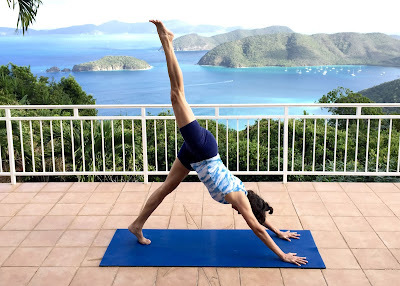 Yoga teacher Bernadette Birney offers her experience with a "magical unsticker for cranky S-I joints" both here and here. And yoga teacher Lillah Schwartz offers another interesting take on SI dysfunction in yoga here. These posts may be especially useful for those who already practice yoga.